Commissioner Service is the group within the Boy Scouts of America that provides direct service to each Scouting unit (pack, troop, team, crew or ship). Commissioners are experienced Scouters who help chartered organizations and unit leaders to achieve the aims of Scouting by using the methods of Scouting. They help to ensure that each unit has strong leadership and they encourage training, promote the use of the unit committee and encourage a relationship with the chartering organization. Commissioner service started with the first national Scout commissioners: Daniel Carter Beard, Peter Bomus and William Verbeck. Local commissioners formed the first councils and started the tradition of direct support to the Scoutmaster. A first-class council had a paid commissioner (now known as a 'Scout executive or council executive'), and could keep 15 cents of each 25 cent registration, while second-class councils with volunteer commissioners could keep five cents. The National Commissioner is a member of the executive board of the National Council. The position was re-established in 1990, and is a four-year term of service. The current National Commissioner is Ellie Morrison of Waco, Texas. The position of regional commissioner and area commissioner were created in 2007 and announced at the October 2007 National Executive Board meeting. These two positions were created "to support councils in the areas of membership, unit charter renewal, and training in support of commissioner service.". The council commissioner is selected by the council. Assistant council commissioners are appointed by the council commissioner with approval from the council. The district commissioner and assistant district commissioners are responsible for recruiting, training, guiding, and evaluating the commissioner staff. The district commissioner is part of what is called the key-three, the other two members being the district chairman and the district executive. Unit commissioners serve and counsel one or more units- packs, troops, teams, crews and ships. They act as a direct representative between the unit and the district. Unit commissioners are adult Scouters that have significant tenure within the Scouting program (ten years' experience is recommended), and are dedicated to seeing individual units succeed. In general, the unit commissioner uses several different tools to measure the success of his or her units. Unit commissioners encourage all of their units to earn the Quality Unit award on a yearly basis and usually visit each of their units at least once a month to make sure the unit is functioning within the aims and goals of the Boy Scouts of America. The unit commissioner is aware of district, council, and local civic and Scouting functions that can help supplement the unit's program. They also promote the monthly district roundtable within their assigned units and make sure that the unit leadership is current on training courses required by the National Council. Unit commissioners also keep in contact with the respective unit committees and the unit's chartered organization. Unit commissioners also are active in the community, assisting with the district's general membership goals for the year. Commissioners are expected to set the proper Scouting example, as they represent the district to the chartered organization and to the unit and its leaders, youth, and parents alike. The unit commissioner is also responsible for assisting the unit with their yearly membership inventory, assisting the Unit Committee conduct the yearly charter renewal meeting, ensuring that the charter application was received at the council service center, and presenting the charter at a meeting of the chartered partner. Usually, a unit's charter with the Boy Scouts of America will be presented directly to the chartered organization at one of the chartered partner's business meetings or social functions. Unit commissioners advise on official uniform policy and badge placement, and occasionally conduct uniform inspections of the units under their aegis; Unit Commissioners may also accompany their units on outings and at special functions. Traditionally, a unit's official charter from the BSA is also presented annually to it by the unit commissioner. Roundtable commissioners use the roundtable meetings to provide unit leaders with resources and training in program skills. The roundtable is a forum for all of the unit leaders and provides opportunities for discourse and training. The Narragansett Council uses a unique structure as of 2010. Instead of being divided into districts, there are 20 community groups which form three service areas. Each service area has a service area commissioner and each community has a community commissioner. Commissioners are expected to complete Basic Leader Training so that they have the essential information they need to provide a safe and successful quality program. Advanced and supplemental training is generally performed at a commissioners college provided at the local council level. 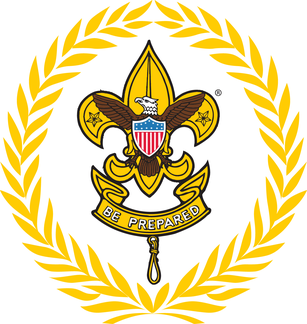 Basic Leader Training for Boy Scout roundtable commissioner is Boy Scout Roundtable Commissioner Training. Basic Leader Training for Cub Scout roundtable commissioner is Cub Scout Roundtable Commissioner and Staff Basic Training. Basic Leader Training for district commissioners, assistant district commissioners, and for unit commissioners is Unit Commissioner Orientation. After completing performance goals, the Arrowhead Honor may be awarded. Commissioners may then earn the Commissioner's Key by completing basic training and serving for at least three years. After five years of service the commissioner may be recognized with the Distinguished Commissioner Service Award. The "wreath of service" is located on all commissioner position emblems. 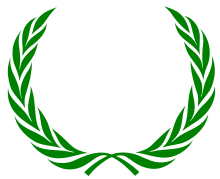 The laurel wreath is a traditional Roman symbol of victory, triumph, accomplishment, and civic service. The BSA uses the laurel as a symbol for the service rendered to units and the continued partnership between volunteers and professionals. The wreath of service represents commitment to program and unit service. "Commissioners in the Boy Scouts of America". Boy Scouts of America. Retrieved July 14, 2007. ^ Wendell, Bryan (May 31, 2018). "Meet the two new volunteers on the BSA's National Key 3". Bryan on Scouting. Scouting Magazine. Archived from the original on June 1, 2018. Retrieved May 31, 2018. ^ "List of Silver Buffalo recipients". Scouting Magazine. Retrieved May 22, 2018. ^ "New Regional/ Area Commissioner Positions Approved" (PDF). Boy Scouts of America. Archived from the original (PDF) on July 20, 2008. Retrieved April 4, 2008. ^ "New Council Service Delivery Structure and Organization". Narragansett Council. 2010. Archived from the original on March 19, 2012. Retrieved February 12, 2019. ^ "Unit Commissioner Progress Record for the Commissioner Key / Arrowhead Honor Award" (PDF). Boy Scouts of America. Archived from the original (PDF) on February 20, 2006. Retrieved June 9, 2006. ^ "The Distinguished Commissioner Service Award" (PDF). Boy Scouts of America. Archived from the original (PDF) on June 23, 2006. Retrieved June 9, 2006. ^ a b "The History of Commissioner Service". Golden Empire Council. Archived from the original on October 28, 2007. Retrieved June 9, 2006.